Famously, in order to undermine and belittle Jewish people, a hoax book named Protocols of the Elders of Zion, purported to be written by an evil Jewish cabal, was widely and maliciously circulated (and passed off as true). 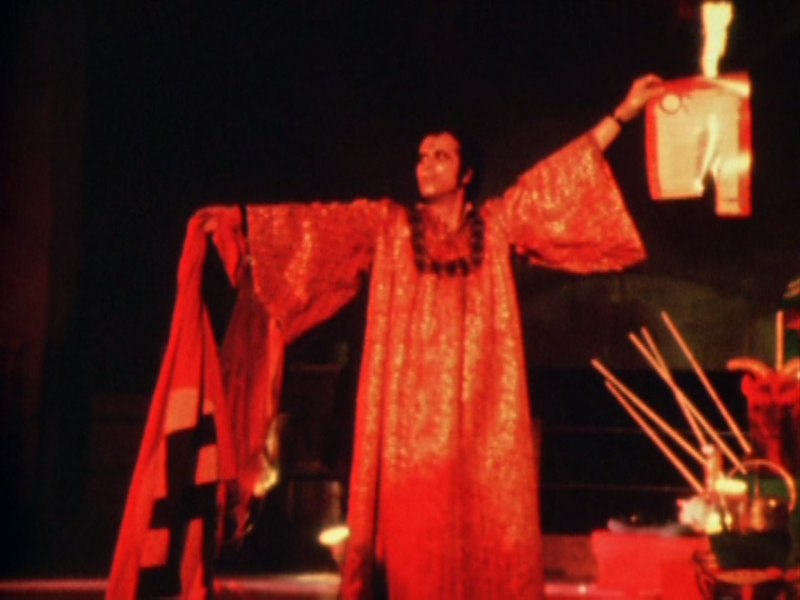 In Kenneth Anger's film Invocation of my Demon Brother, the director appears to have made a similar spoof - this time with the aim of discrediting satanists and occultists in general. Everything presented in the film is a bit silly, daft - like if a 13 year old boy raided the wardrobe department of Alice Cooper and pretended to be a witch. Nonsensical captions, presumably composed by a proto-LolCats automated machine, occasionally interrupt proceedings: "ZAP YOU'RE PREGNANT THAT'S WITCH (RAP)". And, with typical satire, a soundtrack allegedly created by Mick Jagger, the poster child of the dark side of the 1960s, sounds in fact like a chicken let loose in a Moog factory. Sadly, I am led to believe, the entire process was a real, and sincere, attempt at creating a demonic short, intended to frighten and disturb audiences rather than the intended effect - a pitiful laugh, a shrug and, from those who value cinema as a medium, a tut at what Anger has done to the art-form. Invocation of my Demon Brother is a perfect example of the flaws of such "experimental cinema" - someone should had told Mr Anger to wait until he'd finished experimenting, and found himself skilled enough to make a proper film, before unveiling any work. If you want to imagine what this movie feels like, remember the sigh you let out when you open a credit card bill - this feeling sums up the film exactly.